Zamzam Water Facts: What is Zamzam? Zamzam is the name of the well that provides the water to billions of people, have thirstily drunk from throughout history, especially during the Hajj pilgrimage. Zamzam is linked to some of the most important personalities in world history: the Prophets Ibrahim and Ismail (peace be upon them) and Muhammad (peace and blessings be upon him and his family), as well as Ismail's mother Hajira (may Allah be pleased with her). According to Islamic tradition, Prophet Ibrahim (a.s.) rebuilt the Bait-ul-Allah (House of Allah) at the site of the well, a building which had been originally constructed by Prophet Adam (a.s.), and today is called the Kaaba (Qiblah), a building towards which all Muslims around the world face in prayer, five times each day. Zamzam well is located approximately 20 meters east of the Kaaba. Zamzam well is located in Makkah, which is the heart of the Hajj pilgrimage. Zamzam well is 35 meters deep and topped by an elegant dome. The miracle water of Zamzam is still flowing until today. Subhanallah! 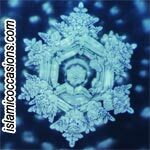 "The difference between Zamzam water and other (city water) was in the quantity of calcium and magnesium salts. The content of these was slightly higher in Zamzam water. This may be why this water refreshes tired Hajis, but more significantly, the water contains fluorides that have an effective germicidal action." "This well has never dried up. On the contrary, it has always fulfilled the demand for water. It has always maintained the same salt composition and taste ever since it came into existence. Its potability has always been universally recognized as pilgrims from all over the world visit the Kaabah every year for Hajj and Umrah, but have never complained about it. Instead, they have always enjoyed the water that refreshes them. Water tastes different at different places. Zamzam water's appeal has always been universal. This water has never been chemically treated or chlorinated as is the case with water pumped into the cities. Biological growth and vegetation usually take place in most wells. This makes the water unpalatable owing to the growth of algae causing taste and odor problems." All traditions agree that Allah (SWT) created the well to provide Hajira, the wife of Prophet Ibrahim (peace be upon him), and her baby Prophet Ismail (peace be upon him) with water in the hot, dry valley they were in, around the year 2000 BC. Prophet Ibrahim (peace be upon him) settled his family there as part of Allah's mission for him. The first thing Hajira had to do then was to look for water in the area. She was searching for it while watching at her son and would run whenever she could not see Ismail. Allah (SWT) saw her effort and miraculously blessed the spot with a water spring, at the feet of Prophet Ismail (as). The appearance of the Zamzam began the settlement of the Makkan valley, where the descendants of Prophet Ismail populated the area. But as time passed, Prophet Ibrahim and Ismail's monotheistic message, which once dominated the region, began taking a backseat to pagan, polytheistic beliefs. Nonetheless, the well of Zamzam retained its importance in later generations. The grandfather of the Prophet, Abdul Muttalib, was honored with the responsibility of taking care of the well and the pilgrims to Makkah. Wait a minute - Aren't you made up of Water? Yes! 72% of your body is made up of water. Imagine how your words affect your own body. When you say, "I'm a failure," or "I'm hopeless," or "I won't get well," imagine how these words weaken your health. Make a choice to say the best words out there. Say often, "I'm wonderful," and "I'm beautiful".